Welcome to WPLearners.com and Thank you for visiting our web page. In this tutorial we should learn you How to Disable Self Pingbacks in WordPress. There are different methods to stop Pingbacks on WordPress blog. Linking to your own posts is a great way to share different articles with your readers. It is also helpful for SEO. McAfee Security Seal Plugin is very important for SEO. If you have Pingbacks is enable then you should have to do. 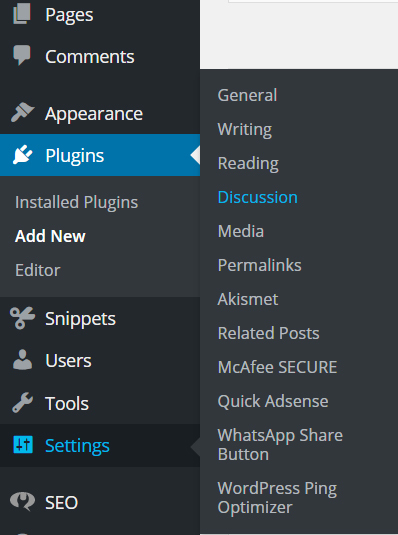 To turns-off self Pingbacks you can install No Self Pings Plugin in WordPress blog. You should have to nothing to do more for this plugin. Just install and Activate Plugin. If you should want to Add Automatically Media Title into WordPress Blog Post. In this method you should Install Disabler Plugin and activate it. Then go to Settings and click on Disabler. Simple click on check Box Disable Self Pings (i.e trackbacks/ pings from your own domain). Then click on Save Changes button. Go to Settings click on Discussion. Uncheck Attempt to notify any blogs links from the article. At last Save Changes button to apply new settings.